1)Metro is aiming to open the first segment in 2019 prior to the Crenshaw/LAX Line opening later that year. Segment A is about 6.4 miles long between the Crenshaw/LAX Line’s Fairview Station in Inglewood and Santa Fe Avenue in Huntington Park (the dotted green line on the above map). This portion — called “rail to rail” — is funded and in the environmental study/design phase. 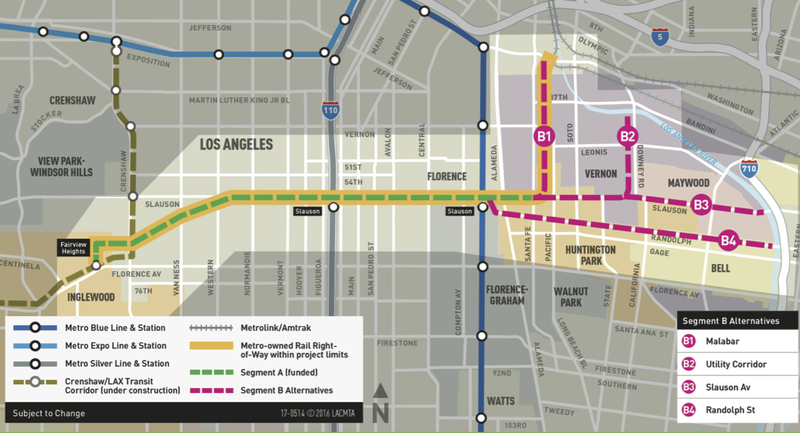 2) Segment A, as the map shows, would provide direct access to the Crenshaw/LAX Line, the Silver Line’s Slauson Station and the Blue Line’s Slauson Station — plus many busy Metro north-south routes, including the heavily-used buses that run on Vermont Avenue. This is also a corridor near many homes, apartments, jobs and schools. See the screen grab below from Google Maps. The project would include landscape and lighting. 3) Four routes remain under study for Segment B between Huntington Park and the river. This part of the the project is called “rail to river” and the four options range from 2.1 miles to 4.3 miles long. 3 to 5 p.m. and 6 to 8 p.m.
5) The B3 and B4 alignments would intersect with the segment of the Los Angeles River Bike Path that runs between Atlantic Boulevard in Vernon and Golden Shore Street in Long Beach. 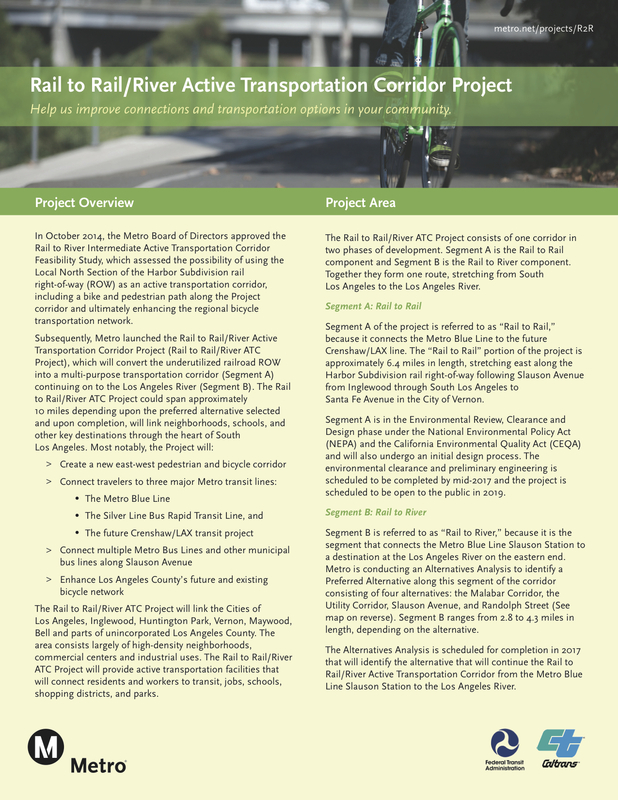 Metro’s Measure M sales tax ballot measure will provide the funding to complete the L.A. River Bike Path to the north through downtown Los Angeles and all the way to and through the San Fernando Valley. 6) The Rail to River project will overall convert approximately 10 miles of railroad tracks into a bike and pedestrian path that could link the cities of Los Angeles, Inglewood, Huntington Park, Vernon, Maywood, and Bell. 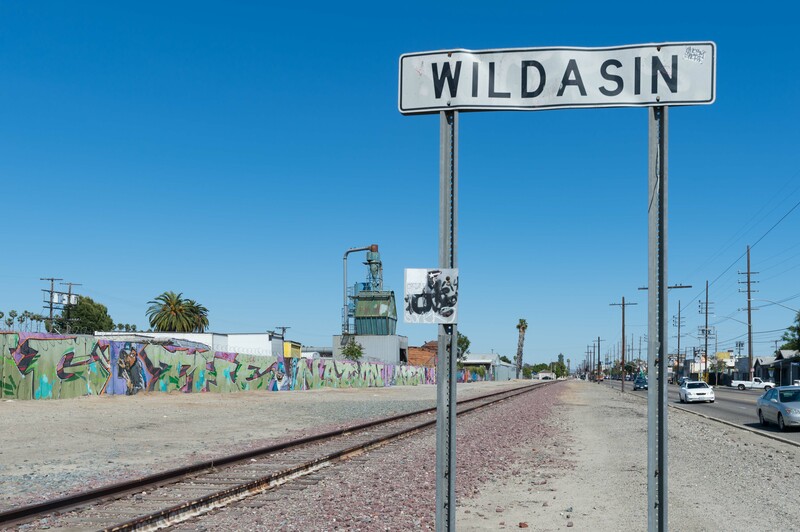 The old tracks along Slauson Avenue between Normandie and Vermont in South L.A. Below is an aerial view of this part of Segment A — it’s dense! At least they aren’t selling off the land. This preserves the right-of-way so something could later go over, under or through if in the future it’s justified. LAUS to LAX is a great route but everything in between on that line is a low priority. Until the homeless begin to cluster camps along this new path, deterring people from using it. A rail line is a better idea in the long run! It should really be an LRT line connecting the Blue and Crenshaw lines with through service to the 96th Street/LAX station. In this way, Metro can FINALLY provide a convenient one-seat-ride between Union Station and the 96th Street/LAX station. I would even go so far as to remodel enough cars to have wider aisle-facing seats and room for luggage in the articulated area, with perhaps with a premium fare on selected express trains. My second choice would be a premium-fare BRT line between Union Station and the LAX West Intermodal Transfer Facility (ITF) Automated People Mover (APM) station being built as part of the Landside Access Modernization Program (LAMP) and stopping in-route only at Metro Center. BTW-The West ITF APM station also serves the Metro 96th Street/LAX station, Here again the buses would be more like those used by Greyhound but possibly articulated. Even with the Regional Connector fully operational, to go between Union Station and the 96th Street/LAX station by train will require a transfer at Willowbrook. Between uncoordinated 12-minute train frequencies on each line and the need to lug baggage up or down the elevator, this will probably not be the first choice of airline passengers transferring between rail and air travel. Rather they would be better off using the Flyaway service. They almost have this right. To start this can be a very inexpensive “streetcar” or LRT line by using the existing rails, adding overhead catenary, passing sidings and stations as a first phase as shown. Later this should be a LAX, Huntington Park, Pico Rivera, Whittier and La Habra line using the Slauson Ave / Randolph Ave rail corridors. This is a very dense underserved corridor between Whittier and the airport that can justify a new rail line..
Umm, okay so I can understand why perhaps the whole “Metrolink from LAX to Union Station” might have not been a popular idea, but I always assumed that was because for whatever reason the idea of having stops at Blue Line/Silver Line, Vermont, La Brea or Crenshaw in between was a bad one somehow. I honestly thought Metrolink could work here if implemented correctly, with stops between Union Station and LAX and eventually a South Bay/Harbor Cities expansion. But I also know Metrolink is expensive for some as well. But I’d say if this a busy bus corridor then why not turn it into a Busway between LAX and Downtown?? Especially seeing as now the current Crenshaw will no longer go into Downtown it seems that the Harbor subdivision would have been perfect for rail. I don’t mind enhanced Bike Paths but I just feel this corridor and the residents in the area deserve more than that.